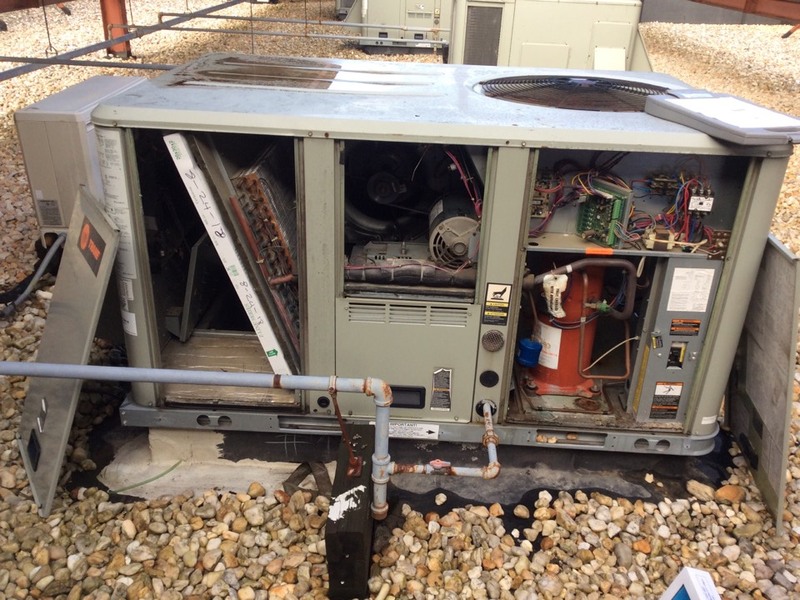 Supreme Air provides Air Conditioning, Heating and Plumbing Services, Repair, Installation, Maintenance, and Tune Up in Gaithersburg, MD and surrounding areas. Yonas arrived when expected and took care of the service needs promptly and carefully. He had the filter I needed on the truck. Installed and wired thermostat. Checked unit operation. Checked air filters. Cleaned drains and traps. Checked wiring and connections. Checked thermostat and unit operations. Got information for drain pan sizes of units 2.1 and 2.3. Sending office dimensions to find drain pans so we can quote customer to replace. Also got information on outdoor fan for unit 1.3, bearings are wearing and is making noise when running. Per Alex, we donâ€™t need the dimensions of coil anymore, customer is going to replace unit. Started pm by replacing filters, inspecting coils, checking belts and blowers. Need to return to finish pm. Uploaded estimates so we can quote customer the repairs noted above. Upon arrival I was told that 4/6 Magic Aire AHU smoke detectors werenâ€™t working. We had replaced zoning with remote sensors and 1 common thermostat, now smoke detectors arenâ€™t shutting off blowers, customer wanted me to see why. During diagnostics I found all AHUs wired the same and smoke detectors donâ€™t have AC 24v wired to them, all smoke detectors are using DC voltage. In order for these smoke detectors to work with hvac systems now that zoning isnâ€™t being used, we would need to run thermostat wire to each detector and have AC 24v contact on each smoke detector break R signal to thermostat. EST Smoke Detector Model #SIGA-SD. Spoke to Bill about this and he would like repairs made, but not today. He asked for me to start PM and get coil and pan sizes for other units. Spring Pm on 03/25/19 On arrival set unit to call for cooling measured supply and return air temp measured voltage and amps inspected electrical connections checked drain and cleaned checked filter cleaned also we installed another zoning for the unit customer she wont the in side the walls instead out side customer she needs to be done today or tomorrow customer renovat the basement bc of this problem she canâ€™t do anything unit tested unit operating normal at this time. Could not complete maintenance. Disconnect on roof is hard wired and needs to be replaced . Also found that the compressor kicks on and pulls lock rotor amps for about 10 seconds causing the entire unit to shake and then cuts off . We were out last June and condemned it . Gave costumer bid for replacement . That will need to be adressed for costumer to have AC in the summer . Right now I removed Y1 from board . Upon arrival I went to garage and met Bill. He showed me air compressor motor contactor that wasnâ€™t pulling in to let unit run. Found contactor getting voltage but not closing. Tested with new one. 208/240v Coil contactor (3pole) not closing, needs to be replaced. Went to supply store and picked one up. Replaced contactor with new one. Returned power and tested. Unit operating normal. Found system operating but only putting out a 10 degree TD . Refrigerant seems like it is low gave costumer a quote to add refrigerant and add a sealer with it . The blower wheel is very dirty with black spots inisde so I copied estimate from before and gave it to them . Costumer approved charging system . Added 12 ounces of R410A and leak sealer . Pressure was at 310 and supply air 98 and return air 72 . System is operating at this time . 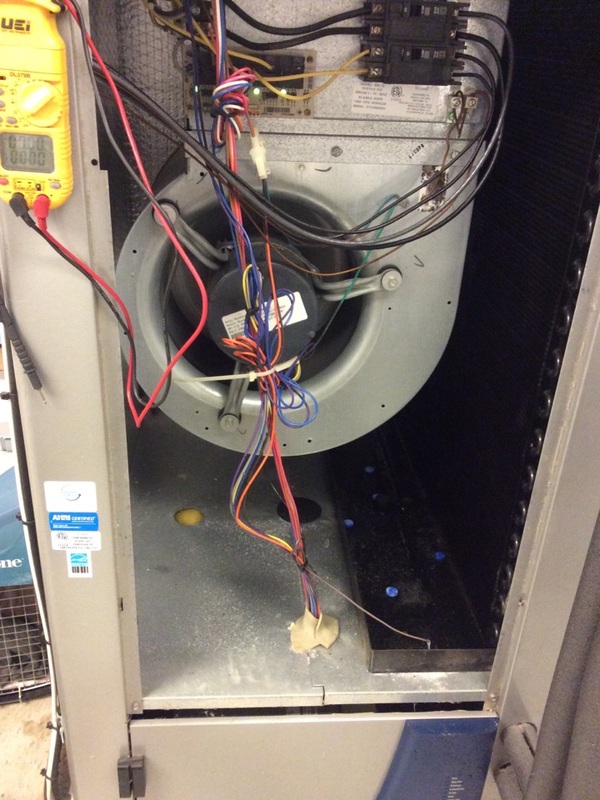 On arrival set unit to call for heat ,unit responded ok ,noticed blower very dirty ,blower needs cleaning before we can proceed with the troubleshooting which could be the cause of unit not heating properly .unit is operating normal at this time but could stop anytime. Upon arrival we replaced broken section of 3inch pvc in ceiling. Found access in barn so we didnt have to cut open ceiling. Once replaced we tested furnace and found exhaust pressure was better, but I still wasnt satisfied. Looked up installation manual and found that they suggest as much 3inch pvc as possible. We had 2inch coming off of unit, it 90 twice, then coupling to 3inch. Removed all 2inch piping and put reducer at top of furnace. All flue is 3inch now. Tested and found the same pressure if flue is on or off of furnace. Started up unit and regulated gas pressure. Tested unit and checked heat rise and operation. Unit now operating normal. Upon arrival I replaced LP Kit on furnace. Went to run system and found venting issue, not pulling in pressure switch. Removed exhaust from furnace and found I was pulling 1.9 inches w.c. With flue attached I am only getting 1.2 inches w.c. Suspecting restriction or issue with flue pipe. Pipe is covered by ceiling. Went outdoors and inspected flue, found no problems. Hooked up vacuum to flue and found nothing restricting. Finally I put fish tape in exhaust and fed in pipe. Found 3inch coupling is disconnected and partially covering some of the flue. Customer had to leave so I couldnâ€™t stay to repair. Need to return with 2 guys, at least 30ft of 3inch pvc, and 2 3inch 90s. Need to replace section of 3 inch pvc being fed outside from top of furnace. Furnace has been left off. Also need to regulate gas pressure once repaired.